Once you have selected your hearing aid(s), your audiologist will program your hearing device(s) based on your audiogram and to your comfort. It is to your benefit to have a full diagnostic hearing evaluation, that includes tone testing and speech testing which are taken into account during hearing aid programming. Your audiologist will work with you on selecting programs for your devices, how to use the devices, how to insert them in your ear, how to remove them, changing batteries, care/use and disinfecting of the ear pieces on the hearing device(s). 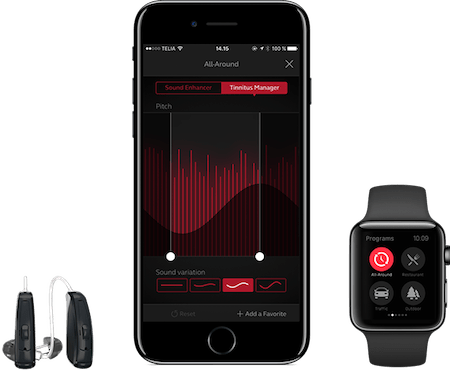 If you have an iphone, this audiologist will assist you in pairing your iphone to your hearing aids. The first time you put the hearing aids in, you will hear a new world of sounds that you have not heard in a while. Sounds that are normally there that you have not heard will be audible. Hearing well again can lead to many positive things in life. You will be able to enjoy effortless hearing. You will experience ease of hearing others around you making sounds and conversations more meaningful. It is important to wear your hearing devices daily in order to know if this is the right solution for you. You will have a 60-day trial period. If it did not work for you, you may return the hearing device(s) for a full refund. You are welcome to try a different hearing aid from another manufacturer if the current one you tried did not meet your needs. We DO NOT charge any restocking fee or any fees for returning the hearing device(s). After the hearing aid fitting, you have an opportunity to try the hearing device(s) for about 2-3 weeks initially and return to the office for a follow-up if you need to come in sooner. Your audiologist will discuss your experience and evaluate if any changes/adjustment with your hearing aid settings are necessary. Your audiologist will go over more on the use and care of the hearing aids and any questions you may have. After this visit, you have additional time to use the device to ensure that you are 100% satisfied with your hearing device(s).